The publishing options available in eClincher are very robust. Not only will you have multiple ways to publish and schedule posts, but you will also have access to several visual marketing tools that make it easy to enhance your posts with visual content. Posting consistently to all of your different social accounts is the foundation of a successful social media presence. Without posting, your business will never attract followers, encourage interaction or prove thought leadership. Let’s be honest though, you already knew this. So, how can your business post consistently to all of your accounts in a productive way? The answer is simple: schedule your posts ahead of time with a tool like eClincher. Posting content manually to all of your social accounts is nearly impossible. That is why nearly all businesses now rely on a tool to schedule posts. With this came a new problem: scheduling posts take a lot of time too! That is why we created Auto Post. What this allows you to do is categorize and save your content into queues. For example, you could create a queue for quotes or promotional posts. Now instead of scheduling each post individually you schedule the entire queue. This one-time schedule will then begin automatically sharing posts from the designated queues. What does this mean for you? It means all you have to do is upload new content to your queues, then sit back and relax. The beauty of Auto Post is that it eliminates the time required to schedule your posts and re-uses old content so you do not have to worry about always finding new content to share. For more information about Auto Post, click here. Have you ever found an amazing piece of content that you wanted to share, but don’t have the time to do it right now? Do you have specific content that you need quick access to over time, such as answers to frequently asked questions or generic promotional content? With eClincher, you can easily save this content to your Drafts. This content will be saved until you delete it, meaning you can use it as a mini content library. Whether you are in your social feeds or directly in the publisher, saving content to your Drafts is as easy as one click. Adding custom images to your social media posts increases engagement and shares. Unfortunately, creating custom images is hard. Well, until now. Thanks to our partnership with Canva, our users can now create custom images directly from their Publishing tab. This revolutionary tool brought design to the masses, meaning that even you can create custom images in a matter of seconds. For more information about Canva, click here. Creating custom images for your social media posts is awesome, but sometimes you just need a picture. Our built-in photo library give you quick access to over 500,000 high quality images. Simply search by keyword and click to attach. For more information about our photo library, click here. There are few things that grab more attention than animated GIFs. All eClincher users have access to over 1,000,000 animated GIFs thanks to our partnership with Giphy. With so many GIFs to choose from, it will be hard to ever run out of things to share. For more information about Giphy, click here. Creating a content calendar for your business may seem like a daunting task, but with the right approach it can be a simple process. Step 1: Identify the topics you will cover and the audience you plan to attract. Step 3: Plan out your posting schedule for each social network. This will include the frequency of posts per day, as well as which types of topics you plan to cover in each time slot. Step three is where eClincher can help you significantly. With our Smart Calendar, you will be able to plan and visualize your social media posts ahead of time. This means you can easily ensure that your posting schedule aligns with your content calendar. Shortening the links you share on social media has several benefits, including the ability to track and customize them. Two of the most popular link shorteners are Bitly and Google Link Shortener. Both of these shorteners are supported by eClincher and you will have the choice between which one you use. Once you decide the shortener you prefer, all of your links will be automatically shortened. This is true in the publisher, as well as in your social feeds. Easily track these links using your analytics to understand which types of content are driving the most traffic. If you manage a lot of social media accounts, this feature will be a life-saver. There are certain posts that you will want to share to multiple accounts at once. These could be new blog posts, promotions or company updates, just to name a few. Posting groups allow you to group together multiple accounts for one-click scheduling. You can name each group whatever you would like, so we highly recommend you create groups for each of the common scenarios where posting to multiple accounts would be necessary. The Inbox is a designated place for all of your actionable messages and notifications. Think of it as your personal assistant. Throughout the day your business will receive new messages, follower requests, comments, mentions and much more. The Inbox collects all of these items and makes it easy for you to handle them all in one place. The problem with most social media management tools is that despite all of your networks being in one place, your notifications and messages are all still separated. We solved this issue with our Unified Social Inbox. Instead of having to visit 10 different places to monitor new followers, direct messages, mentions, etc., you can view them all in one place. Since releasing the Inbox, our users have reported a 50% decrease in the amount of time required to manage their messages and notifications. On top of that, their response rates and times have gone up. Not bad, huh? The Inbox aggregates all of your incoming messages and notifications, but the benefits do not stop there. Think back to the last time you were trying to find an older conversation. You can remember what it was about, and even which network it took place on, but finding it is nearly impossible. If you are lucky, you can scroll back far enough in your notifications to find it. Key word being lucky. The more likely scenario is that you never find it. With Inbox search you can easily find past items. Simply enter a keyword and you will automatically see all of the items that fit the criteria. Once you try this feature you will have a hard time living without it. The Tag feature allows you to categorize certain items for quick access. For example, when someone asks us about a feature that we haven’t rolled out yet, we will tag their question for follow up. Once the new feature is released we can easily access all the individuals that asked about it and notify them that it is ready. The possibilities for tags are endless and you can create as many as you want. With full control over what notifications and messages come to your inbox, you can design the ideal experience based on your needs. This means your inbox will be optimized to make you as productive and organized as possible. On a daily basis you will want to address all the items in your Inbox. When you have completed the required task, you can simply mark the item as completed. This makes it easy to keep track of what you have and have not completed, while also encouraging you to complete each task. You even have a handy notification counter that will show how many uncomplete items you have at all times. Social networks were created for consumers first and businesses second. This means most networks aren’t set up to handle specific business needs. One of these needs is the ability to find old notifications or messages. Most social networks actually delete these notifications and messages after a certain period of time. With eClincher all of your Inbox items are stored forever. Rest assured, if you need to find and old message or notification, all you have to do is search your Inbox. The Feeds tab is home for several different types of feeds. This area is all about productivity. It houses your favorite feeds, custom search feeds, RSS feeds and your feedly feeds. Within eClincher you will have access to many social feeds, such as news feeds, direct message feeds, mention feeds, etc. Depending on your needs, some of these feeds will be significantly more important. Easily add these important feeds to your Favorite for quick access at anytime. The best part is your Favorite feeds can come from any network and are fully customizable. When it comes to productivity, it doesn’t get much better than this. Many marketers will argue that the most powerful part of social media is the access to information. Unlike ever before, businesses have the ability to monitor conversations that current and potential customers are having. Many times they can ever see what their competitors customers are saying to them. Smart businesses are beginning to monitor social media daily to find new ways to connect with customers, improve their product(s) and generate more leads. With eClincher’s custom search feeds, you can create and save feeds based on specific keywords, sentiment, location and more. These feeds are then saved and updated in real-time. This means that throughout the day all you have to do is keep an eye on these feeds. Without a tool like eClincher you would have to remember everyday to go to Twitter or Facebook to manually search. Custom Feeds take the work out of monitoring, allowing you to focus on listening and engaging. For more information on how to effectively monitor social media, click here. Finding content to share can be a very time consuming task. Luckily there are tools that can do the work for you, delivering you the content you want automatically. Arguably the best content curation tool on the market is feedly. We recently partnered with them to make it easier than ever to find and share the content you and your audience love. By entering in your interests, feedly will automatically create a feed with content related to it. For more information about feedly, click here. What are your favorite websites? Chances are they have an RSS feed. With eClincher’s RSS Feeds you can easily consume your favorite website content without ever leaving the tool. Simply add the RSS feeds for your favorite websites and then view new content as it is uploaded. When you see something you like, sharing and scheduling is one click away. If you plan to be successful on social media, being able to measure your results is imperative. With eClincher, you will have access to all the analytical data you need to understand what is and is not working. Social media marketing, when done correctly, can have a tremendous impact on your website traffic. Being able to understand what is and is not driving traffic is crucial. On top of that, you must be able to determine if the traffic you are driving to your site is quality, meaning they spend a lot of time and ultimately decide to buy from you. Google Analytics is the prefered tool of choice for marketers when it comes to tracking website traffic. With eClincher, you will be able to add all of your Google Analytics accounts and easily monitor them in one place. If you are unfamiliar with Google Analytics, do not worry. We have simplified the data, so it is easy to consume and understand. Website traffic isn’t the only metric you want to measure. With our rich social analytics, you will be able to track engagement, audience demographics, influencers and much more. Complete analytics come with all of our plans, so do not worry about having to pay extra for the data you need! The Analytics Dashboard is all about productivity. Much like Favorite Feeds, the Analytics Dashboard allows you to pin you favorite analytics graphs for quick access. This means you can quickly view both Google Analytics and social analytics graphs in one place. Easily drag and drop your graphs to re-order them for maximum productivity. We are huge advocates of sharing content more than once on social media. If you think about it, a typical social media post is seen by less than 10% of your given audience. With this in mind, it makes perfect sense to share content multiple times. This is especially true regarding your top performing content. When you visit your Post Analytics tab, you will see analytics data for all of your social posts. Easily re-schedule content by clicking on the Repost button. Instead of having to re-create your best posts, simply re-schedule them with a few clicks. Easily export your favorite analytics graphs for offline viewing. This feature is perfect for meetings or anytime you won’t have access to the internet. Influencer marketing has taken social media by storm in recent years. Businesses have begun teaming up with highly influential people within their niche, in hopes of reaching their audience and leveraging the trust they have built with them. Sound like a practice exclusive to big brands? Think again! What if we told you that you are already connected with influencers on social media? If you are frantically searching to find them, look no further than our Influencer Analytics. You will be able to see who the most influential people are that follow you, as well as who the most influential people are amongst the group of individuals that engage with your brand the most. Use this information to form relationships and eventually partnerships that will help your business grow. When is the best time to post on social media? The answer is: when the most of your audience is online. Unfortunately, many businesses are unaware of when their audience is most active. You may have basic assumptions, but hard data is always better. That is why we created a Heat Map that shows you exactly when the ideal times are to post. Use this resource to test different posting times. Though you may see more reach when more people are online, you may find out through testing that you get higher engagement during a time with less of your audience online. The key to social media is to test, analyze and optimize. When you manage multiple social media accounts within the same niche, followers tend to overlap. For example, if you are managing a company Twitter account and your CEO’s Twitter account, many of the same followers will be relevant connections for both accounts. Natively on Twitter, there is no productive way to follow the same account with several of your accounts. With eClincher, this process is streamlined. Choose to follow with one or all of your connected Twitter accounts quickly and productively. Since implementing this feature, our users have reported more new followers than ever. This is due in large part to the fact that they aren’t skipping out on connection opportunities due to the many steps required elsewhere. We discussed earlier the rise of influencer marketing. One of the most popular influencer marketing metric tools is Klout. What Klout does is analyze influence based on several different online criteria. Klout then assigns each person an influence number, with 100 being highly influential and 0 being not influential at all. When you open a user’s Twitter profile in eClincher, you will be presented with their Klout Score. This is a great way to determine the quality of new followers, as well as to discover influencers amongst your existing followers. Remembering every conversation you have on social media is hard. Ok let’s be honest, it is downright impossible. Our built in conversation history has your back! When you open the user profile information for one of your followers, you will have immediate access to your conversation history with that person. Quickly remind yourself of prior engagements, so you can start right where you left off! We have spoken with thousands of businesses and marketers and one thing is clear, no one likes having to juggle multiple tools. Unfortunately there hasn’t been an all-in-one solution that can replace all of the tools currently used. That is until now. Through integrations and listening to our customers, we are very confident that eClincher can replace, or at least consolidate, all the tools you currently use. As you can see, eClincher is a complete social media management tool that is guaranteed to make managing your business’s online presence easy and productive. 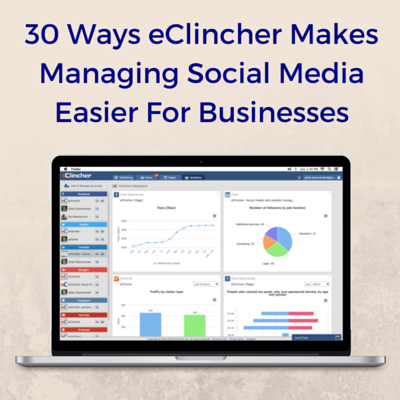 With a laser focus on creating the best social media management tool in the world, you can rest assured that eClincher will continue to get better everyday. This is due in large part to our amazing community of users, whom we work directly with on a daily basis. If you have any suggestions for improvements, do not hesitate to contact us! Interested in trying out eClincher? Start your 14 day free trial today or set up a quick one-on-one demo with one of our customer success experts!